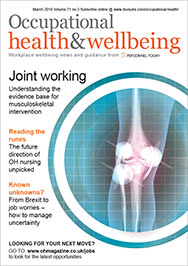 The Health and Safety Executive is using “flawed and incomplete data” to inform occupational health policy and needs to take immediate action to address the issue, MPs have warned1. The committee heard that the HSE uses several sources of occupational ill‑health data, including the Labour Force Survey, specialist reporting schemes such as The Health and Occupation Reporting network (THOR), the Industrial Injuries Disablement Benefit scheme and RIDDOR. However, the Department for Work and Pensions believes that more than 95% of cases covered by RIDDOR go unreported. The committee also expressed concern about numbers of occupational health professionals, both in and outside the HSE. In written evidence, the Institute of Occupational Medicine (IOM) told the committee that “what remains” of the Employment Medical Advisory Service (EMAS) is too small to give effective backup to HSE inspectors on occupational health issues. “The decline in EMAS, and the expert knowledge therein, has significant implications for the future of occupational health in Great Britain,” the IOM said. The HSE’s chief executive, Geoffrey Podger, could not reassure the committee on EMAS’s future. “We are certainly trying to make some expansion of EMAS but it will be a small expansion. We are actually looking to have a part-time chief medical officer and ultimately to expand by two or three posts, but we are in no way thinking of going back to the level of provision that was previously there,” he said.